Everyone seems to love Luzzi, a trattoria just down the street from the Colosseum. Tourists love it because it has checkered tablecloths, waiters who speak English and are (gasp!) friendly to them — but who still yell at each other across the room in Italian, and an earlier opening time for dinner than most other 8pm-and-after restaurants. 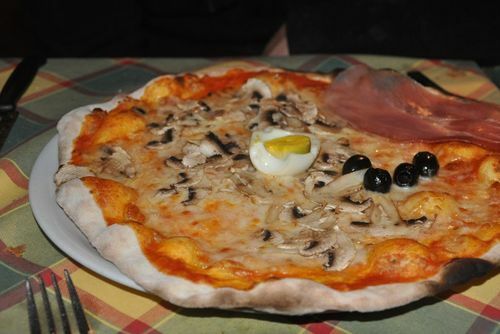 menu's cheap: €6 and under for most pizzas and pastas. The only people who don't love it is foodies. That's because Luzzi is not for those of us who pick apart whether the guanciale tastes smoky or if the pasta is fresh, or who want a wine list (you won't find one here). Luzzi doesn't serve some of the best food in Rome. It doesn't even serve some of the best cheap food in Rome. (For that, see: places in San Lorenzo and Testaccio, including Il Pommidoro and Nuovo Mondo, and some in Trastevere, including Roma Sparita). But Luzzi fits a certain need. 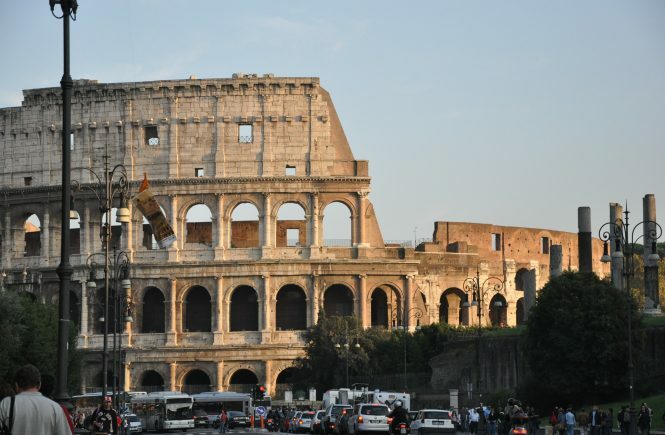 That need is for a place that's fun, cheap, and reliably okay within a 10-minute walk from the Colosseum, an area where you can't throw a guidebook without hitting a terrible, touristy, overpriced place that caters to, and is filled with, people with their noses in the same guidebook. 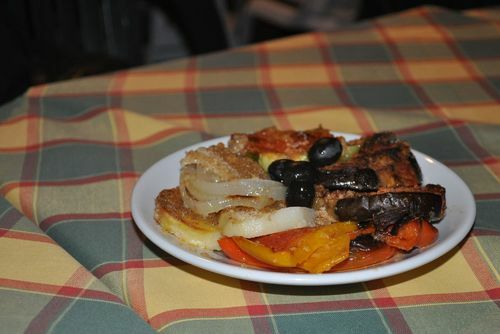 And some of its dishes are pretty good, including the amatriciana or fettucine alla bolognese (both €5.50), and starters like the octopus grigliata or the antipasto that you get yourself. Help yourself to the array of veggies and other goodies in the back, and you'll be charged depending on the size of your plate — this big plate cost about €4 (below). In the evening, though, your best bet at Luzzi is the pizza (shown at top). It doesn't hold up to the pies coming out of Luzzi's neighbor Li Rioni, but then again, Li Rioni is a dedicated pizzeria, no pastas on the menu. Luzzi isn't. And even so, their pizza's pretty darn reliable, always with a proper thin Roman crust and fresh ingredients. (Well, almost always. Never, ever order their pizza at lunch; it seems Luzzi's pizza chef is only on at dinner. So what you'll wind up with, instead, is a kind of undercooked, floppy monstrosity that scares away all the other pizzas on the playground). So am I recommending Luzzi or not? If you're in the Colosseum neighborhood and are at risk of winding up in one of the other myriad and awful places in the area, if a friendly, bustling atmosphere is more important to you than if every dish is perfect, or if you're used to places where guitarists sing "That's Amore" to you and where spaghetti and meatballs are on the menu and you want to try something a little more authentic, then yes. If you're the type who likes to reserve dinners in advance and eat the very best of what Rome has to offer…mmm…probably not. Luzzi. Via di San Giovanni in Laterano 88. Open for lunch and dinner daily except for Wednesday. 06 7096332‎. For a map, click here. Since we returned from our Rome trip, we have failed, sometimes miserably, in recreating a few of our favorite dishes. I’m now realizing that even the “touristy” places we ate at were actually OK. So if they could deliver to suburban NJ, we would gladly order a Luzzi’s pizza or their antipasto right now, ASAP. Too true, Andy! I’m glad you liked Luzzi. Come visit us in Rome again soon! I´m visiting Rome for a couple days. I ate this week at Trattoria Luzzi. The prices are indeed good, that was one of the things that made me go inside. When I got in, I already had a bad impression. That place was very crowded and the waiter, cranky and loudy like apparentely all Italian waiters, made me and my family sit on a table with another couple. Two minutes later another family joined our table as well. The couple got stuck in the corner and five people had to stund up if they wanted to get out. We made our order with some difficulty, the waiters DON`T speak any other language than Italian and don´t make any effort to try and urderstand you. They are very loudy and make a weird face every time you try to order something different, as if you were the most stupid person on Earth. They were indeed fast and brought our order quickly. After eating, we decide to make another order. When the dish came I asked for a knife (mine had been taken away and I was told that they were gonna bring a new one). She didn´t bring the knife and I asked again. Then she brought the knife with an ugly face. The couple sitted next to us noticed our struggle and tried to help. They suggested we asked for spoons to eat the pasta the proper way and we told them we preferd not to, trying not to unplease even more the angry woman waiter. So they ordered the spoons to us, in Italian, then the waiter simply went mad. She started yelling in the middle of the restaurant. Everybody stopped their meals to watch the patetic situation. She was yelling at us in Italian that it was an absurd we order a dish, then ask for a knife and then ask for a spoon. There was nothing we could do about it. The couple next to us tried to calm her down but it didn´t work. Then she went around the restaurant telling all the other customers how idiot we were and that it was our fault she had got so upset. The couple beside us told us that the food there was good but that waiter was a witch. When we decided to pay the bill, I gave the waiter my credit card and my passport. He simply threw the passport at the table and left for passing the card. I don´t recommend this restaurant to anybody. Especially if you don´t like to be treated very badly by rude waiters. If you are Italian you might not care. There were many Italian tourist there today, from outside of Rome, that watched the whole scene and didn´t seem to be impressed. I’m sorry to hear you had such a bad experience! I’ve eaten there quite often but never had the server you mention, only men. Generally, in fact, I’ve had very friendly service there, which is one of the reasons why I go there — and I’ve found that most of the waiters speak English. It’s a shame that you didn’t get to experience the same! I hope that otherwise, you had a good visit to Rome! Hope to visit Luzzi soon, it sounds like a great experience! Thanks for the tip! Sorry but the link under “For map, click here” points to a completely different restaurant. Oops – thanks for the catch! It should be fixed now. I loved this place. I recomended it to my friends but now it changed. Waitress was really awfull. There were many people but her behawiour was terrible. After we eat we wanted another bottle of wine – she said that it’s immposible because another people waiting for table and we have to eat or go away. After that we took dessert because we had real nice conversation with our friends, we ordered a wine also. She didn’t bring it and said to us “food only” (WTF?? )after it , we asked about wine another person. It was a waiter who is working there for many years. He was normal and polite and bring it to us. The atmosphere of this place changed. I recomended it to everybody. Now I will never say any good word about it. Food is really good but theese people destroyed it comletly. I agree. Waitress was so fearful and rude that I can’t belive. People who came with me said that I am crazy if I said anything good about this restaurant. They have right. You’re right – I’ve been hearing spottier and spottier reviews on this place from people who go there! As for myself, I also had a bad experience a couple of months ago – an older, male server who was incredibly rude to myself and my friend. Here’s the thing: It seems as if there are a couple of staff people, mentioned by you and in previous posts, who are indeed rude to clients. But they seem to work mostly during dinners, and inside. I continue to receive excellent, friendly service from the guys who man the tables outside, especially at lunch. Time for another opinion on Trattoria Luzzi. I just ate here last Saturday, the day of the Occupy Rome protests specifically. I ate lunch with my wife and beat the protest passing right next to it by a couple hours so things were safe. The reason I’m writing is because our pizza experience, even at lunch, was fantastic! I’m a foodie, I demand excellent food and drink as often as possible and this occasion absolutely met and surpassed expectations considering the price. We tried the spicy salami pizza, and the white pizza with arugula, cheese and prosciutto. The crust had this wonderful, smoky taste to it from the wood fire ovens, the bottoms were not soggy. Sure we had to wait for the check a little longer than we would have liked but for a good, rather inexpensive meal, I’d recommend this place to anyone. Thanks for your comment! That’s great to hear you had a good experience at Luzzi; I haven’t been in a while. (Although I was at the protest—observing, not participating—right there, so I probably walked right by you!). Who knows, perhaps they’ve gotten other complaints about their lunchtime pizza and put the real pizza chef on at lunch, at least on the weekends. That would be great!